A great watch is one that is timeless, pun intended. But buying the perfect watch is not child’s play, with the millions of options out in the market and other factors to consider as well. Lest you make a mistake and regret it for the next few months, we have put together a handy guide for buying watches online. You can thank us later! 1. Budgeting Is A Big Deal! Before you set out to purchase anything, the first step is always zeroing in on your budget. You don’t want to be aimlessly looking at watches only to realise later that they are way out of your price range. Act smart and decide on how much you’re willing to spend on your next timepiece. Having clarity on a spending limit will not only help you get a watch that doesn’t burn a hole in your wallet, but will also prevent financial crunches in the future. One of the biggest faux pas in shopping is proceeding to shop without understanding your personal style. You don’t want to be the person who wears a sports watch to work or a super-formal timepiece while out for drinks. Watches are an extension of your sense of style and it would be best if you choose a watch that reflects your personality, not one that goes against it. Makes sense? Think of it like this - every watch reflects its wearer. For instance, if you have a vivacious personality, a watch with bold designs and colour would suit you best. If you are artistic by nature, an eccentric timepiece that stands out from the crowd is what you need. The syncing of your watch with your personality will do wonders for your overall look and style. After setting a budget and finalising the type of watch that best suits your style, you are faced with another important decision - selecting who to buy the watch from. You should be careful during this process and make sure you only look at reliable watchmakers. When you buy watches online, you can choose from a wide variety of sellers like Ethos and check to see if they are trustworthy based on customer reviews. While looking for watches online, keep an eye out for cheap replicas of your favourite luxury brands. From Rolex to Cartier, every brand has fallen prey to this faux business. You should start getting suspicious when a luxury watch that usually costs a bomb is available for a significantly cheaper price. Another way to identify a knock-off is by checking the seller details. If anything seems out of place or suspect, don’t take any chances, look for another seller. 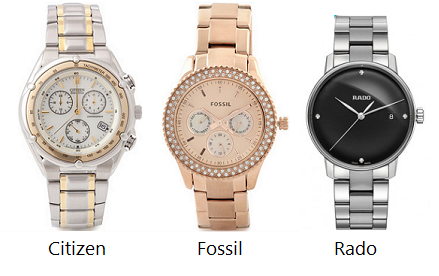 One great thing about purchasing watches online is that you can avail of some great discounts. So, once you have covered all the pointers mentioned above, decide on a good time to purchase the watch. In India, there are a few staple occasions like Diwali, Christmas, and New Years when most sellers offer amazing discounts on their products. So, act smart and time your watch purchase to coincide with these festivals to get the best deal possible. So, that’s that! Follow the tips mentioned above and you’ll be well on your way to buying a watch that not only suits your budget but also reflects your personality. This applies not only to a watch but everything purchased online.Very instructive for those planning to buy a wrist watch.